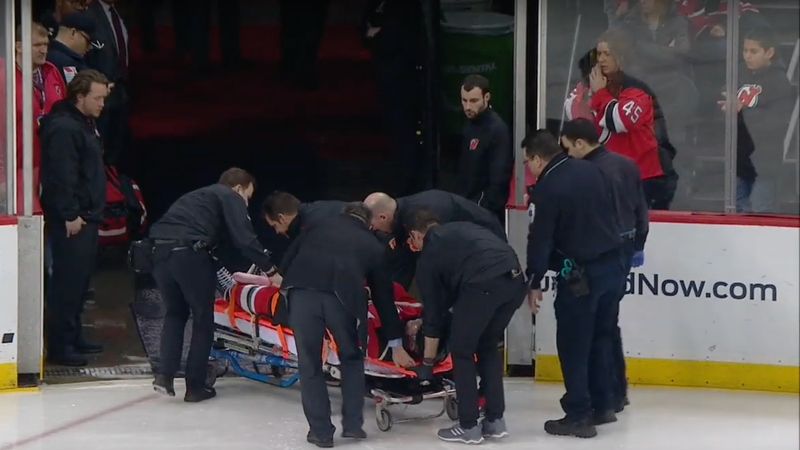 New Jersey Devils defenseman Mirco Mueller was taken out of tonight's game against the flames on a stretcher, after he crashed into the boards behind the net during the third period. Mueller was racing towards the goal and looking to score from a pass from Travis Zajac on a two-on-one, but after the puck went wide and behind the net, Michael Frolik winger both went down and into the end boards. Mueller's head and left shoulder area appeared to be the worst of it. Mueller remained disturbingly motionless on his stomach as the medical staff appeared on the ice, but soon showed movement. When he was loaded onto the stretcher, he was clearly conscious, and while he was taken off the ice, he gave the thumbs up to the fans.